The 14 bilingual poems in this collection describe one day (“de sol a sol”) in the life of a family. Here, a child gives her mama a morning hug (“hueles a miel de abeja”), watches her make tortillas while her rolling pin sings (“está cantando te quiero, te quiero”), helps plant flowers in the garden (“donde mi mamá pasa sus tardes”), wears baby lizards as earrings (“dejo que me muerdan las orejas”), enjoys the freedom of riding her bicycle (“El viento refresca mis brazos/ y piernas./ Me siento libre”), and counting the night stars that wait for her (“Tras la ventana/ las estrellas de la noche esperan”). 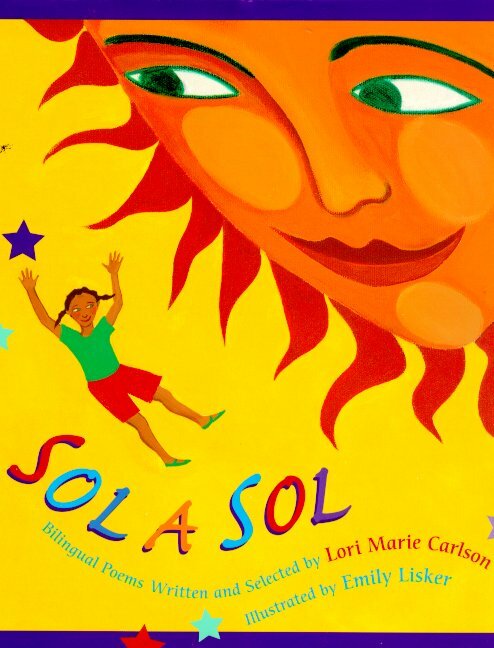 Together with Lisker’s bright primary-colored acrylic paintings, Sol a Sol is an exuberant love song to parents, grandparents, friends, dancing, cats and chocolate. Highly recommended.